FRISCO - The RoughRiders scored six times in the eighth inning Wednesday night, turning a tie game into a 10-5 victory over Corpus Christi before a crowd of 2,772 fans at Dr Pepper Ballpark. The Frisco (5-1) rally cemented a three-game sweep of the Hooks. Corpus Christi (3-4) wiped away a three-run Frisco lead in seventh. With one away in the frame, Lorenzo Quintana cracked a single up the middle and Osvaldo Duarte coaxed a walk from Jefferson Medina. The Hooks then strung together three consecutive RBI singles courtesy of Chas McCormick, Stephen Wrenn, and Abraham Toro, leveling the score at 4. Yoel Espinal entered from the Frisco pen and managed to strand the bases loaded. Justin Ferrell posted a zero in the seventh but ran into trouble in the eighth. Three walks and a Duarte error supplemented a pair of two-run doubles by Brendon Davis and Eliezer Alvarez as the Riders sent 11 men to the plate. 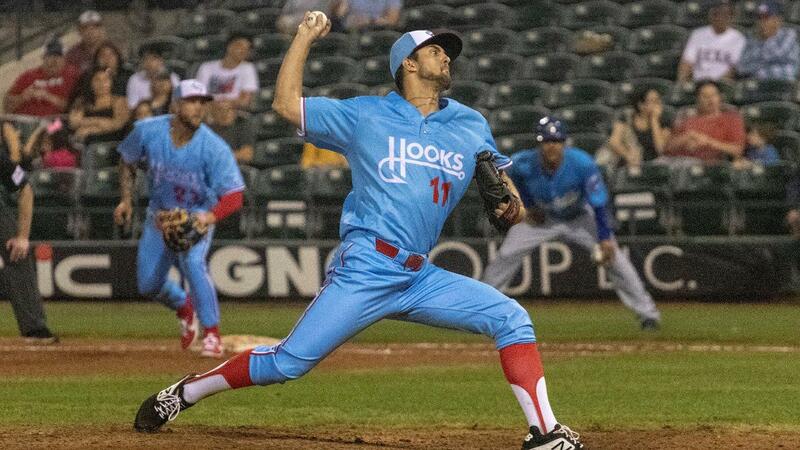 Trailing 10-4, the Hooks notched three two-out singles in the ninth, including an RBI base hit by Josh Rojas. Espinal earned the victory after striking out six over 2 2/3 frames. Corpus Christi starter Carson LaRue was forced to exit early after reaching a pitch count of 75. LaRue fanned six while scattering two runs, five hits, and one walk over 4 1/3 innings. Granden Goetzman put the Hooks on the board by belting a lead-off shot to left field in the second. Lefty Brett Adcock aims to stop the club's three-game slide Thursday night in Amarillo. The Sod Poodles plan to counter with Jesse Scholtens.